Tune your acoustic guitar instantly with precision and ease, within seconds! Â· The most accurate - it displays the exact sound frequency in Hz. Â· A4 Calibration, Tuning fork and Settings (as In-App Purchases). 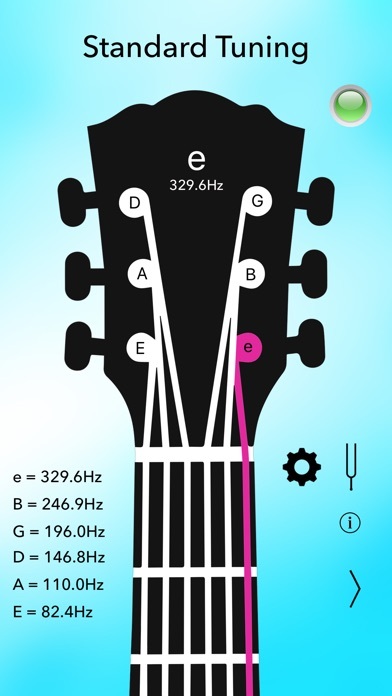 Â· Instant load and fastest tuning - the only tuner optimized for 64 bit. Â· Highest responsiveness and sensitivity. Â· Intuitive user interface with LED tuning indicator. Â· Visual indicators - tuned string lights up. Â· Universal app - works with iPhone, iPad and iPod touch. Please make sure to allow microphone access to this app when prompted. Check it under Settings>Privacy>Microphone. Thank you.